Photos (left): NBC Tonight Show host and car enthusiast Jay Leno poses with Barry Walker after a taping of Jay Leno's Garage. Walker's 1967 Ford Shelby GT-500 is featured on millions of Muscle Car Stamps. (Right): Divide, CO, Postmaster Monica Deluca along with Teller County Sheriff Mike Emsinger with some of the postal bears that were purchased by the public to help emergency personnel gain children's trust in stressful situations. 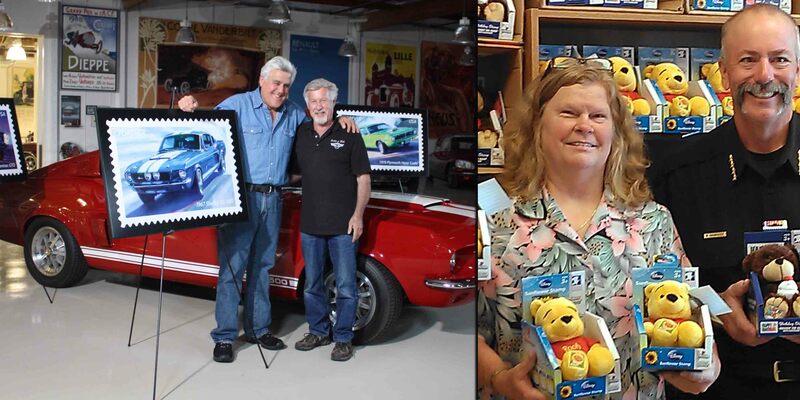 In this episode, learn how the Postal Service's Muscle Cars Forever stamps and "In the Mailbox" Teddy Bears bring smiles to young and old alike. You'll hear from the California owner of one 1960s-era hot rod featured on the Postal Service's popular set of Muscle Car Forever stamps. You'll also hear the heartwarming story of a Colorado community putting postal teddy bears to work as children's ambassadors for local sheriff's deputies. A roundup of postal headlines concludes the program -- along with a chance to win a free collectible folder featuring a sheet of 2011's Indianapolis 500 Forever stamps. Transcript for the July 2013 Show.